It was full-on mango season here in Sri Lanka and I was going absolutely crazy! They’re one of my favourite fruits; full of flavour, minerals and antioxidants. For me, mangoes are best enjoyed as they are; rather than curried or pickled or juiced, although I won’t say no to a good mango juice! Here, in Sri Lanka, mango (amba) is an extremely popular fruit and used in various forms in the local cuisine. From cooking the unripe mangoes in curry, fondly referred to as “amba curry/ maluwa“, making pickles or achcharu, juiced, in desserts and of course, simply cut up and eaten as it is, or sprinkled with salt/pepper/chilli in true Sri Lankan style. I’ve come across panna cotta several times, while watching Masterchef, and while it seemed quite complicated, I decided to give it a go. To Pinterest I turned and found that making a panna cotta wasn’t all as difficult as I thought it to be. 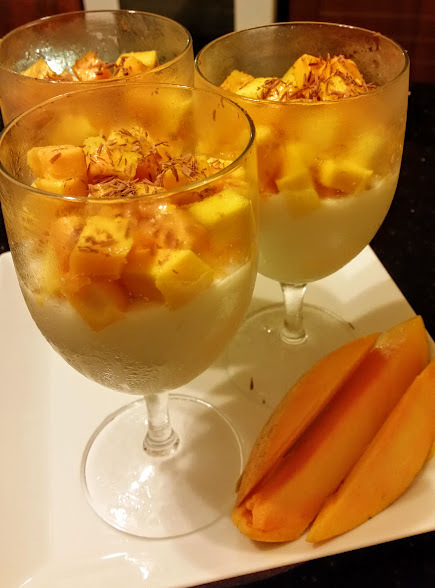 I decided to keep it simple and attempt a vanilla panna cotta, and surrounded by all this luscious mango, serve the dessert topped with fresh mango and shaved chocolate. Panna cotta is an Italian dessert, and is as simple as making jelly from a packet. In essence, it’s a form of dairy: milk/ cream, thickened with gelatine. A good panna cotta will be fine and creamy, lacking any lumps. It does need to chill for several hours before it can be served, so I’d suggest making this well ahead. It can be even made the day before, leaving to chill overnight. Mix the gelatine and water together well and set aside. Over a medium heat, cook the milk and sugar, until bubbles form around the edge of the saucepan. Remove from heat and stir in the vanilla and gelatine, until the gelatine has dissolved well. It’s imperative no lumps are visible. Pour the mixture into 5-6 moulds/ glasses of choice and set to chill for at least 4 hours. Cover the glasses/ moulds with plastic wrap before placing in the refrigerator. Prior to serving, dice the mango and place it gently on top of the panna cottas. 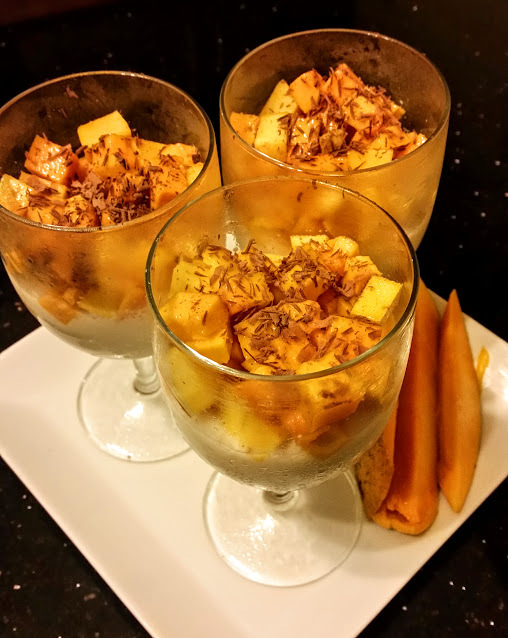 I used a mix of ripe and semi-ripe mangoes, for added texture and crunch. You can top it off with chocolate shavings and/or sprigs of mint. It really is as easy as that! The mango works well with the creamy, pudding-y panna cotta.